THE mention of a famous bak kut teh outlet in Jalan Imbi will most probably strike a chord among many Kuala Lumpur folks, as the restaurant has been dishing out the piping hot delights for more than 40 years. Interestingly, the proprietor has refused to branch out until in recent years. “My father cares most about the quality of food, so he agreed to open a branch only after he was confident that we can recreate the same good old taste, and have the ability to manage the branch well,” said Fion Low. Now, customers can enjoy the soupy delight in a more comfortable environment in Sri Petaling, complete with air-conditioning, marble tables and tile flooring. 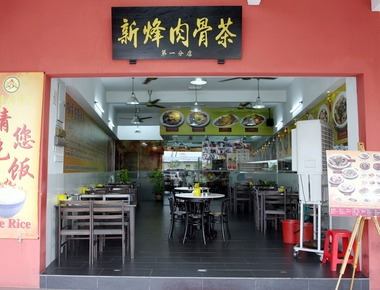 The new outlet, Restoran Sun Fung Bak Kut Teh, was opened about two years ago. It is helmed by Low, her husband Tommy Cheung and uncle Kwok Chee Keong. With the good authentic taste preserved, the outlet is drawing in old regulars and new fans. It still banks on the all-time favourite make-to-order bak kut teh, as opposed to the pre-cooked version that may affect the meat’s texture. Simple and comfort able: Restoran Sun Fung Bak Kut Teh offers a comfortable environment. “The Special Bak Kut Teh and Special Pepper Soup are how we appreciate the meat’s freshness and tenderness, as such, we use the superior cuts, which are neck bone and belly bone (a cut that combines belly and spare ribs) for these two dishes,” said Cheung, who hails from Hong Kong. As the two dishes are cooked only upon order, customers are requested to place their order through phone calls 45 minutes before they reach the restaurant. The bak kut teh soup is prepared with 15 types of Chinese herbs following the family recipe. Cheung said no MSG was used, and they adopted a natural way — adding sugar cane to balance off the flavours of salt and soya sauce — to achieve the optimum taste. The pepper soup does have the “kick”, but the spiciness is not overpowering and the meat’s sweetness can be appreciated. The good taste is a result of the premium quality white pepper used. Low said the restaurant had had customers coming all the way from Klang, yes, the famous bak kut teh hub. “They told us that they loved the strong flavour and aroma of Chinese herbs, which they think is lacking in many bak kut teh restaurants elsewhere,” she said. Cheung emphasised that a fresh batch of meat was used every day. Such freshness has also made pork innards dishes hot sellers at the restaurant. The innards require painstaking preparation process, they are available in the bak kut teh soup, pepper soup and ginger wine soup. Spiced Pig’s Trotters offers a different experience, the gravy flavoured with dark soya sauce, dried chillies, cinnamon and garlic is thick and aromatic. The meaty affair is incomplete without a plate of blanched vegetable, and the operators know the importance of this. Do try out the premium quality Hong Kong Choy Sum, known for its crispness and sweetness. This is the writer’s personal observation and is not an endorsement by StarMetro.